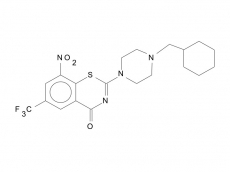 PBTZ169 is a piperazinobenzothiazinone derivative optimized by medicinal chemistry from the lead BTZ043. PBTZ169 has several advantages compared to BTZ043, amongst which are easier chemical synthesis, due to the absence of chiral centers, low cost of goods and better pharmacodynamics. PBTZ169 covalently inhibits DprE1, an enzyme essential for the biosynthesis of key cell wall components. The drug has additive effects with many TB therapeutic agents, both marketed and in development, and has synergic effects with bedaquiline and clofazimine in preclinical models. The company Nearmedic Plus leads PBTZ169 development for the Russian market and associated countries and has completed an open-labelled, dose-escalation phase I study in healthy male volunteers followed by a Multiple Ascending Dose in 2016. This last study investigated the safety, tolerability and pharmacokinetics of PBTZ169 at doses up to 640 mg once daily for 14 days and revealed a good safety profile of the drug. In 2017, a phase IIa EBA study (monotherapy during 14 days) was initiated in DS-TB patients in Russia and Belarus. It was completed in February 2018 with 16 patients enrolled. Nearmedic Plus indicated it confirmed the good safety in DS-TB patients and the statistically significant EBA after 14 days monotherapy in the group of 7 patients treated with 640 mg of PBTZ169. The EPFL-based non-profit Innovative Medicines for Tuberculosis (iM4TB) foundation (Lausanne, Switzerland) is leading PBTZ169 development in the rest of the world. In April 2017, The Bill & Melinda Gates Foundation awarded iM4TB $2.45 million to take the anti-tuberculosis drug candidate PBTZ169 into clinical trials in Europe. In December 2017, iM4TB has initiated a Phase I clinical study in Switzerland investigating single ascending doses of a new bio-enhanced formulation of PBTZ169 and plans to include 32 healthy male volunteers in four investigation panels. The investigation part of the trial will be completed by April 2018.